How to Make Money on Fiverr – Simply Savvy Living – Save. Create. Inspire. If you're looking for ways to make money online, then Fiverr is a great start. This website started back in 2010 and has tremendously grown since then. 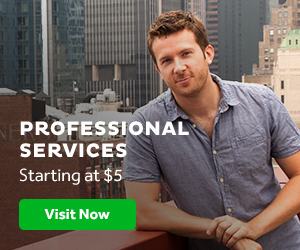 Just like the name, services start at $5, but you can earn even more by utilizing gig extras. Any and everyone can make money on Fiverr and it's super easy to get started. There is a wide range of gigs that you can offer which makes selling on this site very appealing. Wither you have skills in writing, graphic designs, acting, singing, SEO, video or even good advice about specific topics for people. What ever your talent or skill may be, Fiverr is the place for you. I would recommend offering gigs that would take you a short time to deliver. I say this because Fiverr takes 20% of each sale you make. So for each $5 sale you make from your gigs, you would earn $4 and Fiverr would take $1. Keep in mind that for every withdrawl of your funds, Fiverr will charge you $1. Knowing the fees associated with being a Fiverr seller can help in deciding what type of services are actually worth offering. So think of something you can sell and deliver quickly that would be worth the $4 profit you would receive with each order. If you're brand new to Fiverr it's important to get positive feedback ratings. This will help attract more buyers which means more profit for you. When delivering your gigs to buyers it's okay to ask them to leave you feedback instead of waiting for them to do it on their own. Deliver your gigs on time to receive the best ratings and reviews. Be sure to share your gig on social media networks to get the word out even more. A way to earn more from Fiverr is to offer gig extras. This is where you can charge more for specific things such as an extra $5 to deliver the gig in 1 day instead of 3 for example. Or charge an extra $10 to offer a longer version of your gig. It's all up to you so be creative and as unique as possible. Gigs that do best on Fiverr have videos describing exactly what the buyer will receive. It's especially helpful if you're in the video explaining the gig because this gives people a sense of trust and sincerity in what you're offering. As your ratings and experience grows, you get more privileges as a seller. You start out as a level one seller and move up from there if you deliver gigs on time and have good reviews. You really want to avoid late deliveries, cancelled orders and negative reviews. Try to be as clear as possible about your service to help avoid cancelled orders and negative reviews. You will have plenty of space in to explain your gig in the text description, in pictures and video if you have one. Make sure you give yourself adequate time to deliver a gig. If you're running late, let your buyer know so there is open communication and so that they're not quick to leave a bad review. Remember to deliver that gig as soon as possible so it does not negatively affect your delivery rating that Fiverr keeps track of. It's also really important to respond to your inbox messages as well. Fiverr uses an algorithm to rank your gigs in search results. You want to make sure you are a seller that responds quickly to buyers so that you make it on the top of search results within Fiverr. I use to offer gigs on Fiverr doing video testimonials for businesses and individuals. I got a lot of orders, made good money and really enjoyed doing it. I just don't have the time now to keep up with all of the orders. I recommend anyone to do testimonials because they're easy, you get to use your own creativity and it's fun to do.